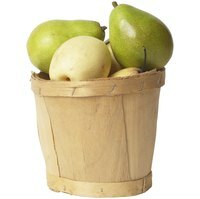 Those rock-hard pears that you may have passed over at the supermarket need not be relegated to non-use until they ripen. Use unripe pears now for a variety of culinary treatments that make virtues out of the pears' firmness, crisp texture and higher pectin levels compared to ripe pears. An unripe pear that is neither sweet nor succulent undergoes a metamorphosis through poaching. Steep the pears in a fragrant bath of fruit-forward white wine, water, sugar, scraped vanilla bean and cinnamon, which yields tender, luscious pears when simmered for about 45 minutes. The poached pears can be served warm, cold or at room temperature, by themselves or accompanied with poaching syrup. Vanilla-bean ice cream and some additional wine for zing add an extra note of indulgence. The unripe pear may serve as a blank canvas for a number of treatments that capitalize on the less-sweet, more vegetable-like qualities of it. With a crisper texture and firmer give than riper pears, slices of unripe pear may act in lieu of crackers as canape foundations onto which smoked salmon and cream cheese may be spread. When sliced and toasted together with cheese and tomato, unripe pear adds texture to a grilled sandwich. Shredding unripe pear and combining it with shredded potato to make fritters can play off the clean, neutral flavors of each. Sauteing cubes of pear prior to adding it to a blue-cheese sauce can mellow out the raw taste of pear, for accompanying meat dishes. One unsung feature of under-ripe fruit is that it contains higher levels of natural pectin than do ripe fruit. When you have an abundance of unripe pears, make jelly from them by cutting them in half and boiling them for an hour. After draining the liquid overnight, you then add sugar and reduce the volume by half through boiling. You can test for doneness by running your finger down the middle of a dribble of jelly on a cold plate; if the line remains intact, it is done. Similar to poaching in that it uses steady heat to tame a recalcitrant pear, baking unripe pears is another way to tackle a possibly bland unpalatable pear. This gives them the chance to develop further sweetness, in particular if you intend the dish for a dessert. Unripe pears are a good candidate for baking, as they will hold their shape and not fall apart as easily as softer, riper specimens. As with poaching, additional sweeteners, wine, and spices assist in bringing out the pears' flavors.